“Doctor, Doctor” at the Norther Sky Theatre. Photo by Len Villano. FISH CREEK — Northern Sky Theater announces ticket sales and casting for the 2017 Summer Season in Door County, Wisconsin. Northern Sky’s Summer Season includes four musical comedies playing in rotating repertory from June 14, 2017 – Aug. 26, 2017 at their outdoor amphitheater in Peninsula State Park. Tickets for the summer are on sale April 1, 2017, online at www.NorthernSkyTheater.com and April 3rd at the Northern Sky box office at the Green Gables shops in north Ephraim or via phone at (920) 854-6117. April office hours are 10am to 4pm Monday through Friday. General admission tickets are $22 for adults, $11 for students, and $6 for children 12 and under. Reserved seats are $7 more per ticket. There is no park sticker required to attend performances in the State Park. This summer will see the return of familiar faces as well as a new troupe of interns. 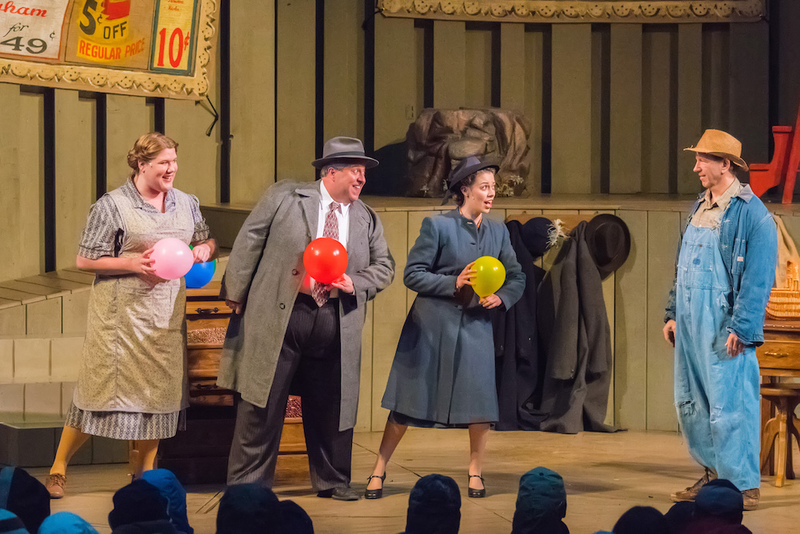 The summer world premiere, “Oklahoma in Wisconsin,” by Richard Castle and Matthew Levine, features returning company members Doug Mancheski, Eva Nimmer, Bill Theisen, Rhonda Rae Busch, Alex Campea, and introduces performing intern John Brotherhood. Last year’s cast for Matt Zembrowski’s Doctor! Doctor! returns with the addition of performing intern, Laura Paruzynski, as Annie Norberg. Victory Farm, by Emilie Coulson, Katie Dahl and James Valcq, returns for it’s third run with Northern Sky. Returning cast members include Doug Mancheski, Eva Nimmer, and Molly Rhode. New for the 2017 cast are Jeffrey Herbst, Chase Stoeger, and local Sevastopol High School graduate, Isaiah Spetz, as the German POWs. Lumberjacks in Love, by Fred Alley and James Kaplan, returns to the woods with the same all-star cast from last year’s 20th anniversary of this fan favorite. The company’s fall performance schedule and casting for Naked Radio will be announced in April and fall tickets go on sale May 1st. *Some exceptions to the schedule do exist. Please see the Northern Sky website for performance dates and times. For suggestions or tips, message the page.